For many decades the Catalan people have garnered a sense of independence and sovereignty, despite being a province of Spain. These feelings were put into action last week with a referendum that would decide the fate of Catalonia. With a turnout of only 43%, 90% of those that voted supported Catalonian independence, while only 8% disagreed. The results might have some inaccuracies, as many ballot boxes were seized by police and more than half of the Catalonian people did not participate. Regardless of the illegality of the referendum or the possible implications for the Spanish economy, dialogue needs to be encouraged among the two entities. A secession of this magnitude would impact both groups negatively, creating more conflict than there was to begin with. Police efforts by the Spanish government to stop the referendum led to violent clashes between civilians and law enforcement officials. Neither group is complying with the other’s demand. As Catalonia insists that they will be declaring independence soon, the central government in Madrid claims that such action is illegal under the 1978 constitution. Despite apologizing for the mistreatment of Catalan voters, the Spanish government refuses to accept the legitimacy of of the referendum or initiate any dialogue. Protesters from both sides have taken to the streets of Spain dressed in white, asking for peaceful negotiation instead of riots. A sense of pride in your culture can be positive but when it reaches the point of unyielding nationalism it can be a dangerous thing. Europe needs solidarity, especially in its current economic state, rather than selfishness. Catalonia gaining independence could inspire other groups to do the same, setting off a chain reaction of more conflict and weakening nations in the continent. “Catalonia is a part of Spain with regional pride and patriotism like many others such as the Basque region. While they have complete freedom to feel proud of their customs and beliefs, revolting against the constitution and central government, after being told not to, is completely illegal. The Spanish government could have handled the referendum in a more pacific way, but what the Catalonians were doing was wrong and had to be stopped. The people to blame are those who head the generalidad, the Catalan government. Spanish government has the authority to imprison them, and they should,” said sophomore Manuel Nuñez. Feelings of independence in Catalonia were fueled by a number of reasons such as a state with a separate identity and a large economic responsibility to Spain. Catalans believe that they are not Spanish because they have their own language and traditions that are not respected by Spain. In addition, Catalonia contributes billions of euros in taxes to the central government in Madrid, which causes anger among the province’s citizens. Some people say that being a part of Spain does not mean that the Catalan people will have to relinquish their traditions, so it just adds to the diversity of Spain like other provinces such as the Basque Country that have their own language and customs. As one of the wealthiest regions of Spain, it would be expected that Catalonia would contribute more in taxes than other poorer region. Nonetheless, these grievances can serve as a point of negotiation with the Spanish central government to be granted some sort of economic autonomy similar to the tax autonomy given to the Basque Country. “I think that Catalonian independence is relevant to European politics as it is years in the making and could represent a strong image of Spanish culture. 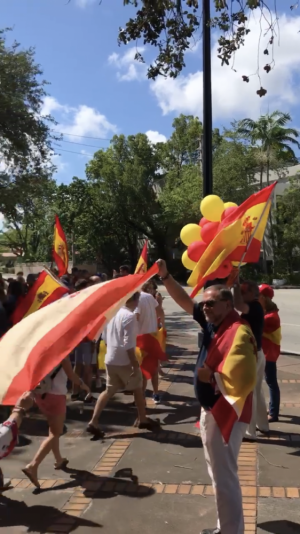 Although France and Spain do not recognize the region’s independence, I think it is deserving of more attention and consideration,” said freshman Louis LaFontisee. The independence of Catalonia could have serious implications for the Spanish economy, which is already in a fragile state and directly influences the economies of neighboring countries. A decision like this would not only hurt Spain but also the Catalan economy, as already major enterprises based in the province have relocated due to the possibility of a separation from Spain. Extreme feelings of nationalism and pride often only bring about conflict and unnecessary violence. “Passion can be destructive when it is motivated by fanaticism and racism. Nationalistic passion being the worst of them all,” said Mario Vargas Llosa, nobel prize winning author and Spanish citizen, at a recent anti-independence protest. Catalan officials made the decision of continuing with the referendum even after being warned of its illegality. This is no excuse for the unnecessary violence, but what was done in Catalonia was clearly against the law. Catalonia can maintain its sense of pride in its culture and heritage and have a sense of individuality without cutting off ties with Spain. The current situation can serve as an opportunity for the Catalan and Spanish government to come together and listen to the demands/causes of unrest within Catalonia, and hopefully resolve them without seceding. Catalonian independence comes with a lot of strings attached, for both the Spanish and Catalan community. Pro-Catalonia groups consider referendum results reason enough to be granted independence, but when 67% of the Catalan population did not participate, a silent majority is left unspoken for. Ultimately, dialogue needs to be established between the two sides before any decisions can be made. A lack of peaceful discourse will only lead to more violence.